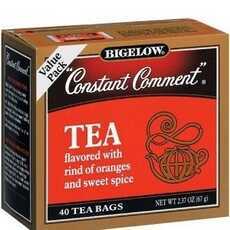 Enjoy Bigelow Constant Comment Tea . Our 40 Tea Bag Value Pack Preserves Freshness While Providing Value At A Significantly Reduced Price Per Cup. Inside You Will Find 10 Airtight Value Packs That Lock In Flavor To Ensure Your Full Enjoyment. Each Tea Bag Contains The Same Amount Of Tea As In The Individually Wrapped Tea Bags Available In Our 20 Tea Bag Constant Comment Boxes. The Famous Delicious Blend Of Fine Tea Flavored With Rind Of Oranges And Sweet Spice. Makes 120 Cups. Constant Comment Was Created To Bring More Flavor To Tea. Made From An Original Bigelow Recipe, Constant Comment Is A Blend Of The Finest Mountain Teas Deliciously Flavored With Rind Of Oranges And Sweet Spice. Delicious Hot, Superb Iced. Enjoy It Often By Yourself Or With Your Family And Friends. Another Quality Product From The Bigelow Family, Blenders Of Fine Tea For Three Generations. Made In U.S.A. (Note: Description is informational only. Please refer to ingredients label on product prior to use and address any health questions to your Health Professional prior to use.